In a Strange Land: Let the House of Usher "Egg" Hunt Begin! Let the House of Usher "Egg" Hunt Begin! For the House of Usher simulation, we've always included clues in the virtual House itself. Now for what may be the finale for the project, at least in my courses, I've put some real-life clues here and there on our campus. I suppose this is what game-theorists call (awkwardly) "gamification" in classes. Students will hunt campus for the clues, the first four of which appear here. If they find a light bulb they get a point and a quest that will help them in the Usher simulation. Even before we read Ernest Cline's light-hearted cyberpunk (that's not a typo) novel Ready Player One, I was calling them "Easter Eggs," in honor of the little gifts that coders leave in games. In Cline's novel, those seeking the eggs became "Gunters." Alas, the craft store was all out of plastic eggs. 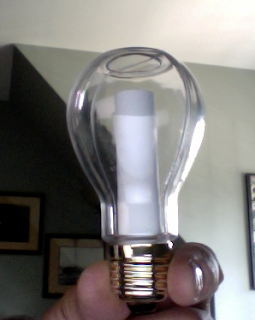 They had little containers shaped like plastic light-bulbs for the clues, an appropriate metaphor. Here are the first four clues, Gunters! “In the Jungle, the mighty jungle....” If you can finish this sentence, you may well find an egg to help you on your quest. More on the way! Happy Hunting! Finale for Usher & Teaching in Virtual Worlds?